ONE is a campaign and advocacy effort working to end extreme poverty, especially in Africa. 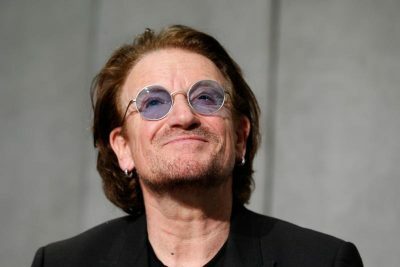 One of its current focuses, Bono told reporters Sept. 19, is education for girls and young women. Some “130 million girls around the world do not go to school, because they are girls,” he said. “Poverty is sexist” is the campaign slogan, he said. Scholas began in Pope Francis’ Archdiocese of Buenos Aires, supporting education in poor neighborhoods by pairing their schools with private schools and institutions in wealthier neighborhoods. The organization has grown to other countries and supports a variety of exchange programs aimed at promoting education, encouraging creativity and teaching young people about respect, tolerance and peace. Bono said the conversation with the pope touched on many topics, including poverty, commerce and meeting the U.N. Sustainable Development Goals.